The Maypole is a symbol of warmth and light that celebrates (and welcomes) the return of summer. Photo courtesy of Bavarian Times. GRAFENWOEHR, Germany — Flowers have started to bloom, the sun has finally (yes, finally) peeked out from behind the winter clouds and the sound of chirping birds fills the air. Yes, spring is in the air, summer is following closely behind, and in Germany, the first of May is a day to celebrate the changing seasons. 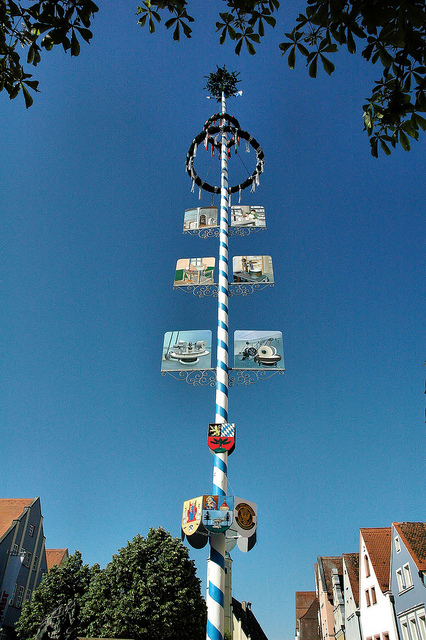 Every year, on May Day, communities across Southern Germany gather to erect the Maypole (Maibaum in German). This tradition is done by manpower alone. About a dozen burley men dressed in overalls or lederhosen grapple the wooden pole, eventually bringing the 20 meter (or more) allegorical emblem upright. But it doesn’t stop there — the maypole must be defended. It is tradition for different villages to steal each others’ poles on the day of the celebration. (Physically, I cannot comprehend how this is possible, but legend says it’s been done). 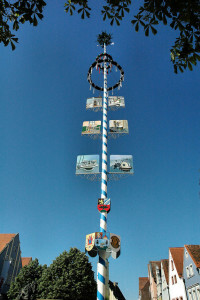 Numerous celebrations take place at the foot of pole to include singing, dancing and feasting. The town’s festive stump usually remains standing until Pentecost, although some towns may decide to leave it up until summer. The towering emblem can’t be missed and generally stands upright in the center of villages inviting light and warmth to the community.